Inquire about evidence when confronted with opinions. To help, there are four kinds to look for: no evidence, soft evidence, hard evidence, and 3rd party validated evidence. Next week, save yourself a lot of future effort by staying off the solution for as long as possible and focus on gathering evidence. It helps you focus on high impact activities. I am helping a client with a post-mortem examination of a recently departed key employee, when he says, “I think we did everything right with her, but obviously we missed something.” I know what he’s referring to because they worked hard to make sure this hire was as perfect as it could be. I try not to dismiss his concerns too quickly because it’s helpful to wallow in the muck a bit, but future dependent events like hiring will never be an exact science. 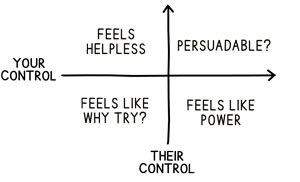 Let’s revisit the control grid (above) again because hiring executives falls into the upper right. Yes, you, the employer, have control, but they, the candidate/employee, have control too. His team made the best decision they could, knowing what they knew, but things changed. Human’s predictive ability isn’t great. When changes in the business landscape happened, she didn’t react as predicted. As we dig deeper, other long-time employees didn’t necessarily act as expected either. Digging even deeper, long-time employees interactions with her were even more surprising. Add in that he plucked her from an organization she has a wonderful relationship with, has a spouse and kids and family in the area,. . .I could go on. What I’m getting at is there’s a lot of chaos in life and most of it was and is out of his control. The best approach is planning for flexibility. Candidate #2 and #3, where did they come up short? Are we still in touch? Previous candidates and previous employees, where do they stand? Have we kept in touch and nurtured them with our vision of the future? Those activities are in our control. Focus there. When change happens, especially key person, planned flexibility gives your brain some immediate options and feels a little like control. I’m halfway through a book called “Farsighted: How We Make the Decisions That Matter the Most” and it’s interesting but even with advances in AI and machine learning, we’re not going to predict the future anytime soon. The best advice is still: apply a process to decisions at hand while keeping your eyes on the destination. Make the best decision for now, then make a quick reminder that you’re going to need to adjust. Things will be ok.
As you may know, I support a little non-profit (Wear Yellow Nebraska) that fills a narrow niche in the fight against cancer. They provide rides to patients in treatment who have no one else to turn to for transportation. There are other organizations that provide rides, like the American Cancer Society and volunteer groups, but there are a surprising number of last minute rides needed that these services can’t fill. For evidence, last year Wear Yellow Nebraska provided 2,000 such last-minute rides each year. That’s just in Omaha and Lincoln. Crazy. WYN’s major fundraiser is a bike ride. If you happen to be near Omaha or Lincoln on May 11, 2019, you can ride the rolling hills of Ashland, Nebraska with a group of about 700 cyclists. When you’re done, stuff your face with pancakes. It’s all included. However, if you won’t be nearby, you can join my team as a virtual rider. Either way, take a minute and learn about this narrow but large problem because it may be needed in your area too. 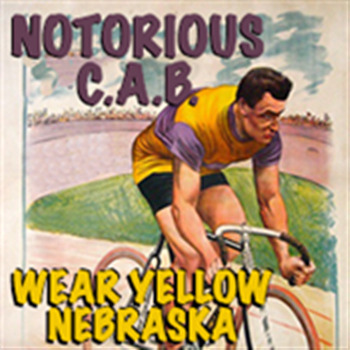 Look for the team named, Notorious C.A.B., quite possibly the world’s best WYN bike-ride team name ever. Just sayin’.